They must be smiling in Dearborn, MI looking back on those dark years in 2008 wondering if the outrageous investments with hybrids and electric technology would pan out. Although the news loves to bash electric vehicles with their so-called low sales numbers, not too many ask what these predictions were based on. If the numbers were taken from the unrealistic pre-2008 then yes, they are low. If the numbers are taken from the post-2008 adjusted market, then electric and hybrids have done very well. 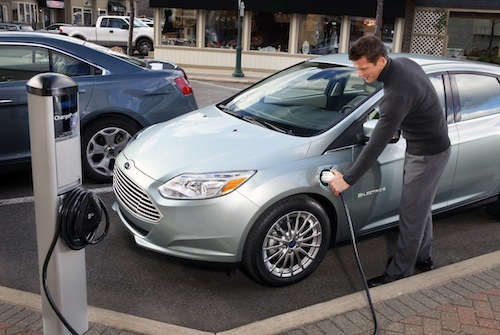 Ford High Hybrid and Electric Sales. It must have been an epic moment when Ford renegotiated its loans in 2006, only to see the market crumble with the biggest recession our country has seen two years later. Basically Ford had bet on the promise of a future before a recession pushed them in the right direction. Four years later, this past month was good news for the Dearborn carmaker as it is set to witness its previous record shattered. Ford expects at least 5,500 hybrids for January alone. Fusion Hybrid Leads The Way. The Fusion Hybrid is leading the way, of course, followed by the C-MAX. The Fusion Hybrid alone makes up a big part of the 21,000-plus sales of all Fusion models sold. With the introduction of the Energi line up, the C-Max Energi plug-in hybrid, PHEV and Fusion Energi, and the Focus Electric vehicle, EV, the company has a full line of hybrids, PHEVs and EV. So far, Ford’s success hinges on the fact that they successfully woe away drivers from other carmakers with 70 percent of Fusion Hybrid sold to drivers who abandoned another makers. Even though hybrids amount to 3% of the total industry at the moment, every research points to sales growth, something that will only be helped by the relentless rise in petroleum prices. It will be interesting to see this year how much of a hybrid challenge Ford is to Toyota. According to Ford, Toyota's hybrid market share has fallen from 68 percent to 60 percent and Ford jumped from 7 percent to 16 percent. If Ford continues the way it has, Toyota might finally have a hybrid challenge. Ford understands it has another tough year going forward as the numbers come in with over-enthusiastic prediction and expectation that cannot reflect the current economic reality. However, if it continues the way it has done, there is no reason why it shouldn’t do better and in a few year offer a serious challenge to Toyota. In the meantime, Ford is one Detroit carmaker breathing a sigh of relief justifying these past years’ worth of investments.